The impact of the Brexit vote on UK politics was far reaching and the results of the UK general election have shown just how far reaching. In a post last year following the Brexit vote I said “one lasting impact of the Brexit vote is likely to be on the make-up of British politics”. 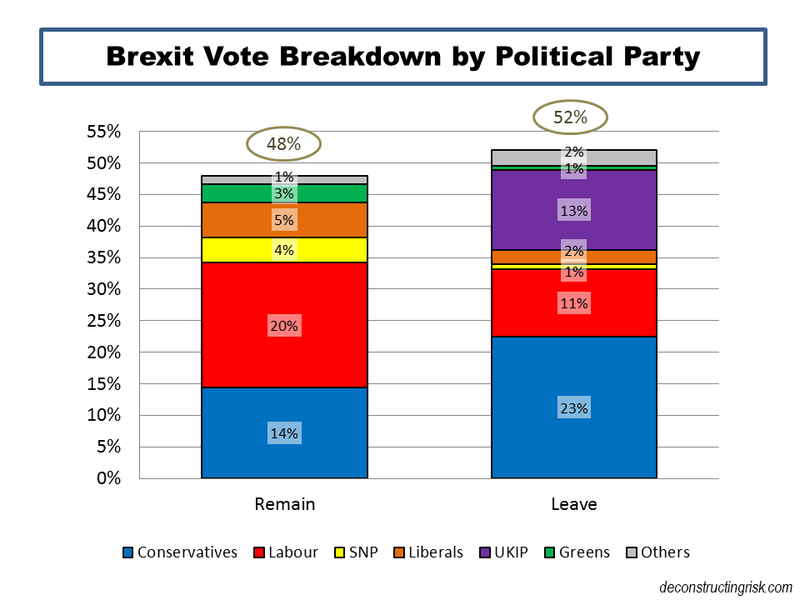 The graph below shows the political allegiance breakdown of the Brexit vote. The Brexit issue meant that the previous political (social class) allegiances of the UK electorate has splintered further by factors such as age and by views on immigration and/or globalisation. 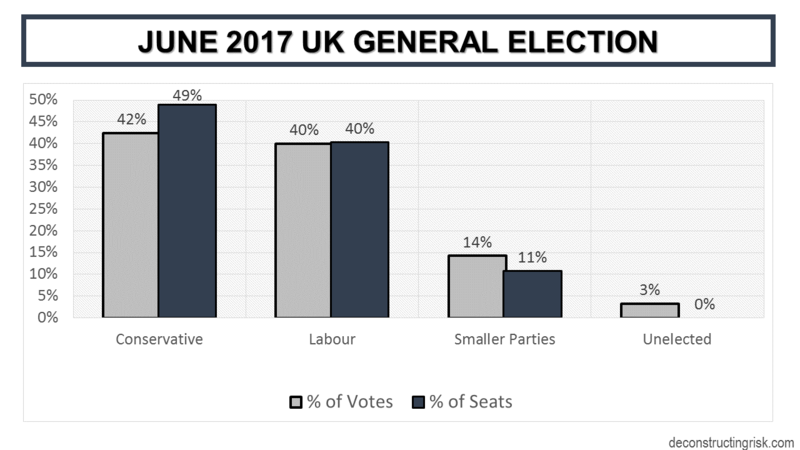 This has led to some extraordinary results in Thursday’s election: conservatives winning seats off the Scottish nationalists with swings as large as 16%, a significant number (reportingly 25%) of the collapsed UKIP vote going to Labour, a resurgent left wing Labour winning in some of the wealthiest constituencies in the UK are just a few examples. Adding to the political volatility is that the Brexit referendum vote has to be implemented by politicians elected under a parliamentary system by a first past the post (FPTP) electoral construct. 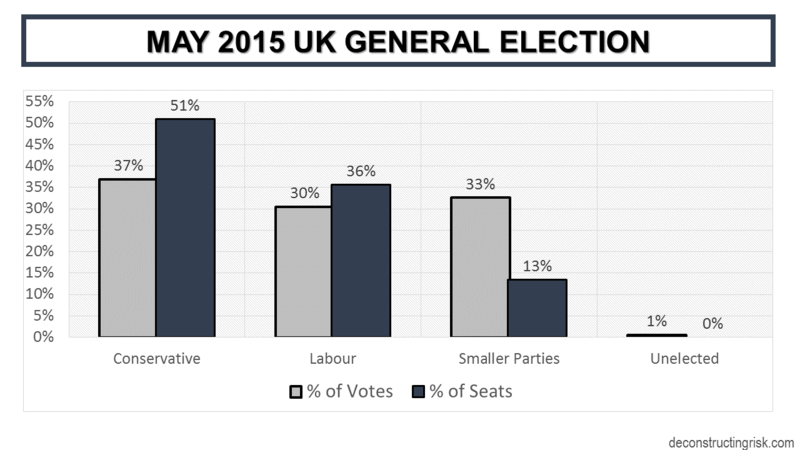 Given the 4% spread in the Brexit vote, the difference between the seats allocated under a FPTP electoral system as opposed to a proportional representation (PR) one can be material, as the results of the 2015 general election with spreads of +14%/-19% show. It is therefore highly interesting to see that the difference between the FPTP and PR systems in Thursday’s election result is significantly less with spreads of +6%/-3%. There can be little doubt that the earthquake that the Brexit vote set off in UK politics is far from over and there will be more tremors to come as the Brexit negotiations play out. On the plus side, this election has resulted in a closer parliamentary representation of the UK electorate than the 2015 election. On the minus side, it reflects the uncertainty over the exact type of Brexit that the British electorate wants. And that uncertainty looks set to continue. Strong and stable government in the UK looks to be more aspirational than reality in the coming years. Many, like me, are scratching their heads this weekend about the Brexit vote. Besides the usual little Englanders and other crazies who crave an idealised yesteryear, a significant proportion of sensible people registered their protest in the vote, in a result that is clearly against their and their children’s economic interest. Places in the UK with significant employers dependent upon European access, places like Sunderland, Swindon and Flintshire (with bases for Nissan, Honda and Airbus), voted to leave. They choose to ignore the consensus advice of the experts and their political leaders, the elite if you like. That’s what makes the outcome of this vote so significant. The thing is, would the populations of other major European countries also register such a protest, even where it was clearly against their interest? 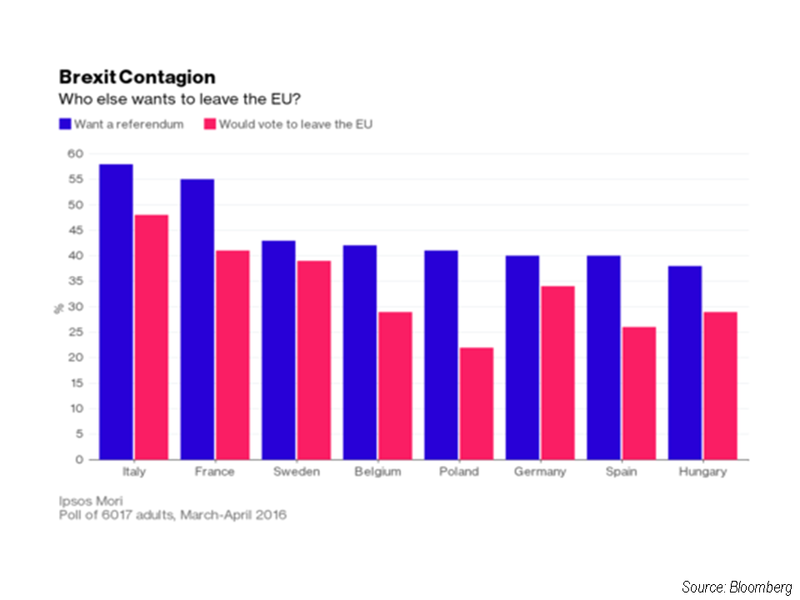 The graph below from Bloomberg suggests it could be a distinct possibility. The problem now is that the EU cannot be seen to give the UK a deal which may encourage more discord. And, of course, the UK has no idea what deal it wants. The political turmoil in the UK government means they can’t even decide when to trigger Article 50 of the Lisbon Treaty, which will likely need a vote in parliament. 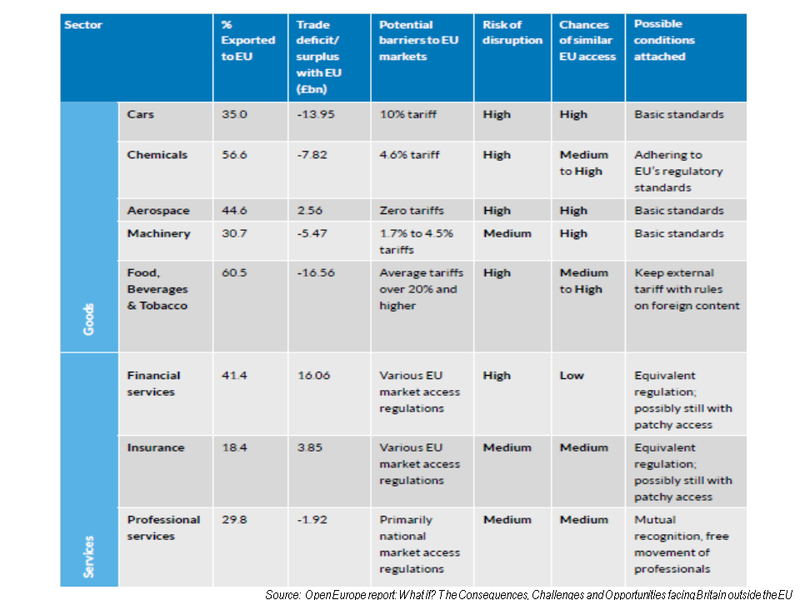 The economic factors upon which any deal should be decided are illustrated in the exhibit below from a 2015 Open Europe report on Brexit. These economic factors may not play as important a part in the negotiations as they should given the emotive opposition to free labour movement, aka migration, which is a key issue for all Europeans. 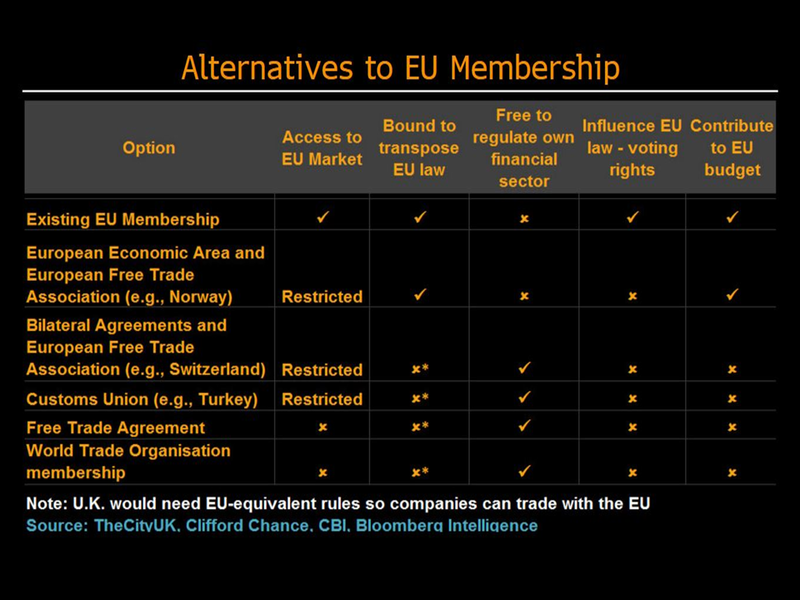 Matching these interests to the exit options available, as outlined in the exhibit below from Bloomberg, whilst satisfying the diverse opinions of the Brexiteers is the mess that we are now in. Any deal, whenever it arrives, will likely have to be voted upon again by the British public, maybe in the form of a general election. Before that agreement can be made, we are in for an extended period of uncertainty. Radical uncertainties are a more apt term, with the emphasis on the radical. Let’s hope that pitchforks are not part of our future.